The Millionizer Brush has a multitude of bristles which separate lashes for a fanned-out effect. The elastomer applicator is ultra-flexible with both long and short bristles to coat lashes. The Excess Wiper removes excess mascara: no overload, no clumps. It leaves the brush coated with just the right amount of formula to achieve a volumised appearance with no overload and no clumps. We love mascara. The fuller and longer our lashes the happier we are. We’ve tried and tested a lot of mascaras that claim to offer you the perfection of falsies – with the ease of a wand, and many don’t live up to the hype. First and foremost, L’Oreal’s Volume Million Lashes has a really great brush. It’s flexible but solid. Meaning it catches even your smallest lashes to ensure they all get an even coat. The nifty wiper effectively remove excess product too, so it’s much harder to get that overdone and clumpy look. We don’t care what anyone says, clumpy mascara is not a look we aspire to achieve. Ever. The mascara did make our lashes appear fuller and longer, in a natural way. Which we loved. It lasted well and gave our lashes the lift we needed. Even in hot weather this one doesn’t run or smudge. 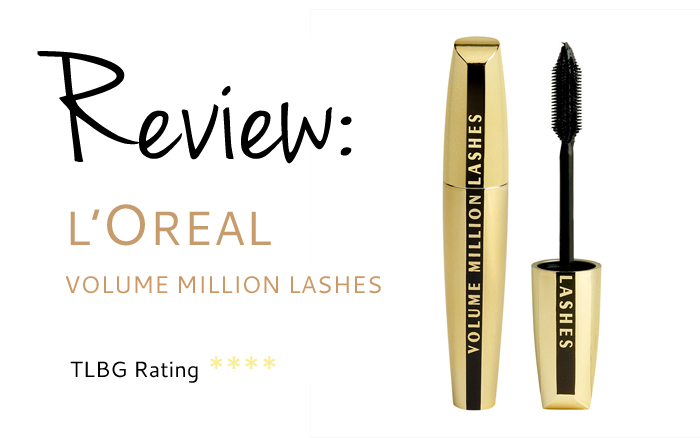 If you want a natural-full look to your lashes this mascara is for you. It gives you minimal clumping with a great lift and volume. It’s a great mascara for definition. We approve.